The job search is probably one of my least favorite things about life changes. There is something about the combination of insecurity and bravado that makes the whole experience a little unsettling. Much like my last job search, I started the process unnecessarily early long before we had left Bloomington and before the "Summer in which Sara Got No Sleep" began. I updated my LinkedIn and broke out all my networking skills to track down everyone I knew who knew someone in Austin. I lined up all sorts of meetings for myself with these connections when Cale and I were in Austin in May for our failed house-hunting trip. I even applied for what appeared to be a perfect position with International Studies Abroad. The more people I spoke with the more often I heard the same mantra: "You have to have a local address and phone number or they just throw your resume out without even a second glance." I went so far as to get myself a Skype 512 number. However, after all that effort, my summer started to ramp up, and I found myself without even the slightest hint of time to even remotely consider the job search. Initially this made me quite anxious. Sure, Cale had done whatever magical financial math he does that means we always seem to have enough money* and had assured me that I had until January to find a job. But as the main breadwinner, I found that hard to believe. *We decided way back in Florida that the solution to an ongoing problem in which Sara was perpetually convinced we were on the verge of destitution was that Sara was no longer allowed to participate in the household financial management. Given that I hate to shop and spend money, there was no threat that I would just spend money willy-nilly oblivious to our financial circumstances. It has appeared to work rather well for us for the past seven or eight years. Despite my concerns, my summer soon became too busy for me to even find time to worry about worrying. So I just stopped worrying altogether. There was nothing to be done about it until we were in Austin. When we finally arrived in Austin, I began my job search in earnest. Set up my color-coded spreadsheet to track jobs, applications, responses, etc. Searched web sites. Networked like a pro. I applied for anything and everything that I felt even remotely qualified for and interested in. Fourteen positions in total. Not because I was willing to accept any position, but because I wanted the experience applying, writing cover letters, interviewing, etc. And, of course, I wanted contingency plans if that perfect position never appeared or didn't pan out. When you are unemployed and in the middle of a job search, it feels like it will never end and you will write cover letters (the bane of my existence) for the rest of your life. But, to be honest, I have always been very lucky with the speed with which I find great positions. 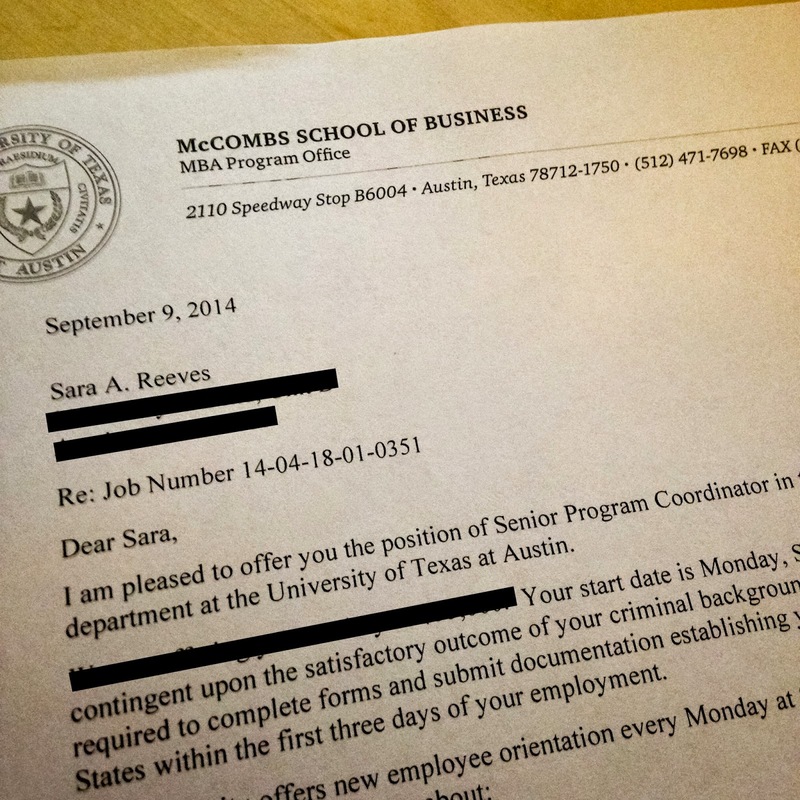 In this case, I had a screening call for the Senior Program Coordinator position with the McCombs School of Business MBA+ Program on August 13, two weeks after our move. That led to an in-person interview a week later. For my previous job as a Program Manager at the Institute for International Business, I left that interview convinced I had bombed it. I went directly home, drank two PBRs, and ate a box of Kraft Macaroni and Cheese. Then I scheduled an appointment with SPEA Career Services to work on my interview skills. I was shocked when they actually offered me the job. For this interview though, I left feeling really confident. I felt that it was a job that I could do well and enjoy doing and that those I had spoken with felt the same way and that they would enjoy working with me. Then began the terrible waiting game of doubt. They only interviewed two candidates for the job and anticipated making an offer the next week. When Friday of the following week came and went with no call, I convinced myself they offered the position to the other candidate and he or she was taking the long (Labor Day) weekend to make the decision. I anticipated a call letting me know I wasn't being offered the position on Tuesday. But Tuesday came and went. On Wednesday, I was actually in an interview when my phone started to ring. I had it on silent, but even the vibrations were distracting enough that I had to apologize and grab it from my bag to end the call. As I walked back to the Jeep following the interview, I checked my messages and saw a garbled voice-mail-to-text translation that told me that the call was from the hiring manager at McCombs, but it was too unintelligible to know if it was good or bad news. Thankfully, she had sent me an email too. And there, clearly, in black and white in front of me was a job offer for a great position. And to top it off, they offered me the max budgeted salary rather than the minimum posted with the position in order to side-step the negotiation process. It was actually just a tiny bit more than what I had decided I would try to negotiate for (don't tell the boss! ), so there were no complaints from me. For the rest of the day the hiring manager and I played a frustrating game of phone tag. I called and left her a message to accept the position and sent an email as well. She called my back while I was in the middle of discovering the cat had a festering, puss oozing wound on his head. Etc. But finally, we spoke on the phone and made it almost* official. *Even though I had accepted the offer over the phone, I was really waiting for the offer letter to make it feel official, which is why I have been a little silent on the job details, as it took another week to finally get that letter. I had promised myself when we first moved to Austin (and discovered there was a Krispy Kreme literally down the street) that I could have a doughnut when I got a job. I spent the rest of the day (when I wasn't with the cat at the vet) checking for the hot light. Finally, that evening I had my (three) celebratory doughnut(s). There you have it. I can haz job. I'll start work on Monday, and I am sure that after the first week, I will have a clearer picture of my responsibilities. However, I know that I will be recruiting and scoping consulting projects for McCombs MBA students across all the MBA programs. They average 30-40 projects for teams of 4-6 students each semester. In addition, I will be arranging professional development leadership workshops and coordinating students' access to a roster of executive coaches. I will be able to inject a little of my interest in international into the position, recruiting projects with international or multinational firms, working with international students, and possibly, leading one of the MBA Global Connections trips. The Global Connections program is run out of the MBA+ office where I will work and the office staff help with in-country logistics for the trips in the summer. I'll check back in again next week after I actually can had job for a little while.